I remember speaking to Nick (Dr Burnorium) about 2 years ago, he was telling about his mission to make his own sauce and showing me sample labels, it was obvious he was very excited about the whole process. 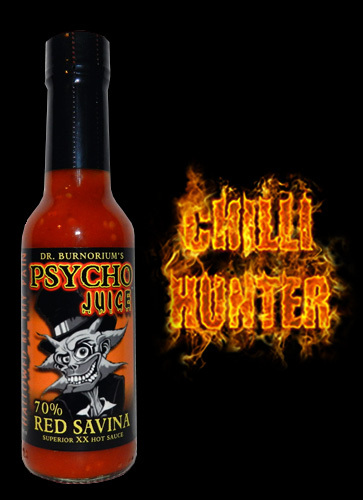 His Psycho Juice range pays homage to the pepper, this one being 70% Habanaro Red Savina. The fantastic flavour of the pepper is front and centre with saltiness bringing up the rear, its thick to the point of nearly being a pulp with seeds and all making this a great sauce.